Jake is having a hard time. He's lost his job as a photojournalist and he's struggling with substance abuse which has permanently damaged his romantic relationship. Desperate and out of options, he takes a job helping a caretaker at a reclusive lodge on a remote island in the Pacific Northwest. The idea is to get clean, take some photos and hopefully get his life back on track but the remote lodge might be more than his psyche can take, particularly when his photos seem to be premonitions of events to come. 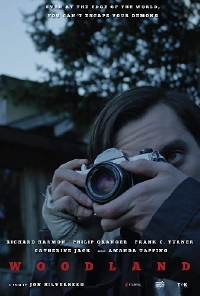 Woodland stars Richard Harmon ("The 100") as Jake, the struggling photojournalist. Almost immediately upon arrival, he finds a place he converts to a darkroom; the process of developing his photos seems to bring him a bit of peace in an otherwise haunted existence. His partner is Sparky (Philip Granger), the ageing caretaker who is getting too old to do some of the more physically taxing work required to keep the lodge in tip-top shape over the winter. The pair get on almost immediately, Sparky is used to his ways but is friendly and obviously happy for the company but Jake struggles. He does the work and occasionally the pair interact but mostly, Jake wanders around the island, taking photos, remembering his mistakes and overcoming the memories by getting high any way he can. The concept behind Woodland is familiar and sadly, writer/director Jon Silverberg doesn't bring anything particularly new to the table. The movie relies on the photos and the eerie setting to create a sense of mystery and dread but the movie never quite gets there. The music and cinematography are fine but they do little to help build any sense of mood and as a result, the movie feels a little vacant. The only stroke of genius in the storytelling is the movie's period setting which provides an easy out for the lack of cell phones and Jake's continued old-school photography; it's an easy but effective out of what could otherwise be a glaring plot issue. The highlight of Woodland is the performances. Harmon, by far the highlight of the last few seasons of "The 100," gives a solid performance as a haunted young man, while Granger is likeable and endearing as the ageing father-figure. Each actor has great presence and the pair share a great chemistry that comes through when they're together on-screen but they're not given much to do, particularly Granger who seems almost inconsequential to the entire story. Woodland is an interesting concept and though the movie features some solid performances, it ultimately misses the mark.